Rising 30 feet in the air atop Quarry Hill, the Old Powder House is the oldest stone building in the state of Massachusetts. Aside from being a towering relic, the Old Powder House had a prominent role as a gun powder storage facility in the lead-up to the American Revolution, contributing to its inclusion in 1972 on the City of Somerville’s city seal. The tower was built of stone and originally featured three interior levels, complete with a fireplace and chimney. The Powder House was built in either 1703 or 1704 by the French Protestant shipbuilder Jean Mallet on land (then known as Two Penny Brook Quarry) purchased from Jonathan Foskett. During this time, the structure functioned not as a gunpowder storage facility, but rather as a windmill for the Mallet farm. 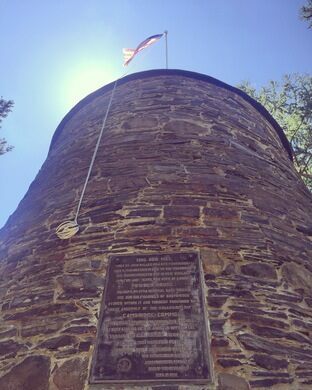 In 1747, the Mallet family sold their land to the Massachusetts Bay Colony, where the windmill structure was utilized as a powder magazine (from which it derives its modern day namesake). In 1774, the Powder House found itself at the center of one of the pivotal events leading up to the American Revolution. On September 1, 1774, General Thomas Gage landed with British troops at the 10 Hills Farm on Mystic River, whereupon they marched up Broadway and seized the 250 barrels of gunpowder that were being stored at the former Mallet farm. This event marked the first act of aggression by the British toward the colonies and consequently trigged the “Powder Alarm,” where many individuals from the surrounding villages prepared to march to Boston for battle, though their actions proved to be premature. The structure did, however, serve as a critical munitions depot for the Continental Army during the 1775-76 siege of Boston, a fact which is honored by a nearby bronze sculpture of a hat worn by said soldiers. In 1818, the Massachusetts Bay Colony sold the land to Peter Tufts, later inherited by Nathan Tufts (for whom the surrounding park is named), during which time the Powder House was incorporated into the Powder House Farm. Moreover, the building was also used as a storage facility for “Old Powder House Brand” pickles. The structure and surrounding land were finally sold to Somerville in 1892 for the price of $1. The land was then converted into a park, designed by Horace Eaton, where the Old Power House was renovated and repaired. This unassuming stone commemorates a condiment factory gone up in smoke.